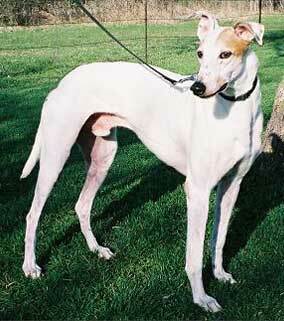 Petey, aka Jam's Bagel, is a handsome, 10-year-old white-and-fawn male, born July 1, 1995. His sire is Jam's Carlin, and his dam is Jam's Countess. 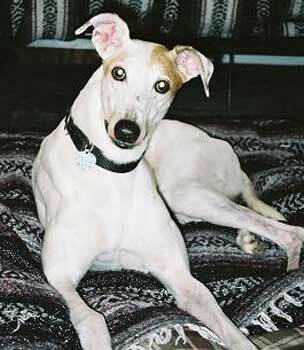 Greyhound-Data.org shows 16 races to Petey's credit, starting January 1, 1997, in Orange Park, and finishing on June 25, 1997, at Jacksonville Circuit in Florida. Petey was found as a stray in the Sulphur Springs area. His whereabouts since his last race to when he was found are unknown. 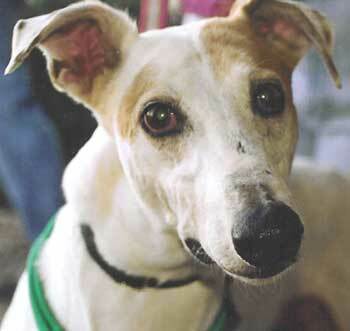 Petey was heartworm positive when he arrived at GALT, but was treated and not adopted until he tested negative. Petey is a really quick learner, and just wants to be a companion to someone. Petey was adopted, and unfortunately it was not to be his forever home, as Petey and the small dogs eventually did not get along. Petey is not small animal or cat tolerant.